While the name may be new to you, the people behind it are far from strangers to the business. Goose Foot is a coming together of the celebrated design skills and ingenuity of Ollerton Engineering Services, and the 21st Century manufacturing pedigree of the WEC Group, one of the UK’s largest Engineering & Fabrication companies, who have both been manufacturing street furniture for over 30 years. With a combined 70 years of delivering highly successful engineering solutions – nationally and internationally – this new venture has been forged specifically to offer a fresh, new alternative to the street furniture options available today. As for the name…simple. Goose Foot was the sign on the leafy lane where we once had a home. And there should always be a nod to the pride of the past when you’re looking to build for the future. All Goose Foot Street Furniture products are manufactured to the highest standards in our onsite workshop with all the latest Laser Cutting and Robotic Welding Technology which is why we can offer cost effective prices. We have also been manufacturing seats for various street furniture companies over the years, which means we can custom-build products to customers specifications on a subcontract basis, in batch orders or as one-off bespoke products. If you can’t find what you’re looking for within our range, please feel free to contact us. As part of the WEC Group, we also cater for the metalwork & fabrication needs of architects all over the world and we specialize in the manufacture of stainless steel sculptures, public art, canopies, and bridges to name but a few. 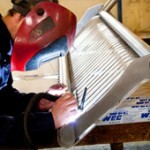 To find out more about our architectural metalwork division, please visit our m-tec website.